A card from my little one. :o) (I also got a necklace, a plant, & a framed photograph.) Just got home from his swimming lesson, I'll go to the gym for about an hour in about an hour & them we get to do some chores & maybe even some sewing for Mother's Day. I need to drop of a crib size quilt on Friday for long arming - I finished cutting for it yesterday while at the DC Modern Quilt Guild meeting. Do you have plans? Cute. 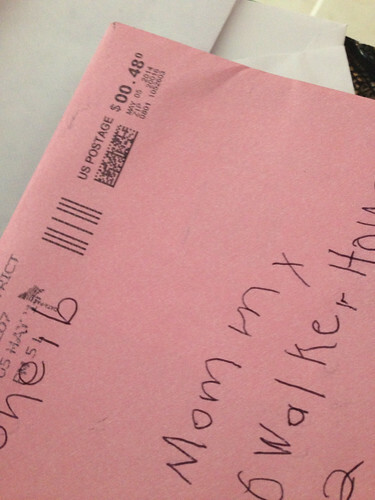 I love that he actually mailed it.